When the chock broke on my motorcycle trailer, I knew it was time to level up my wheel chock game. My trailer gets used a few times a week, not just for my own motorcycles (I have a handful) but also for towing motorcycles for riders all over the city. I needed something of quality that was going to be sturdy, reliable, and quick and easy to adjust. 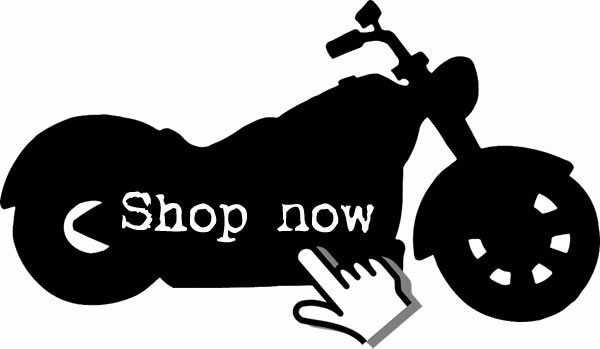 I started looking at the options on my favorite website for motorcycle towing equipment. That’s when I noticed the Black Widow 2 Piece Motorcycle Wheel Chock, and three things immediately drew me to it. I know that Condor is typically seen as “the” name when it comes to motorcycle wheel chocks, and I’m a picky guy, so I don’t mind paying more for a brand name that I already know. But then I started to compare the Condor wheel chock with the Black Widow wheel chock. The more I looked into it, the more I realized that the Condor didn’t have anything more to offer than the Black Widow did, despite the Condor being three times more expensive. Are Condor owners just paying for the brand name? The Black Widow actually looked better than the Condor on paper, so I decided to give it a try. 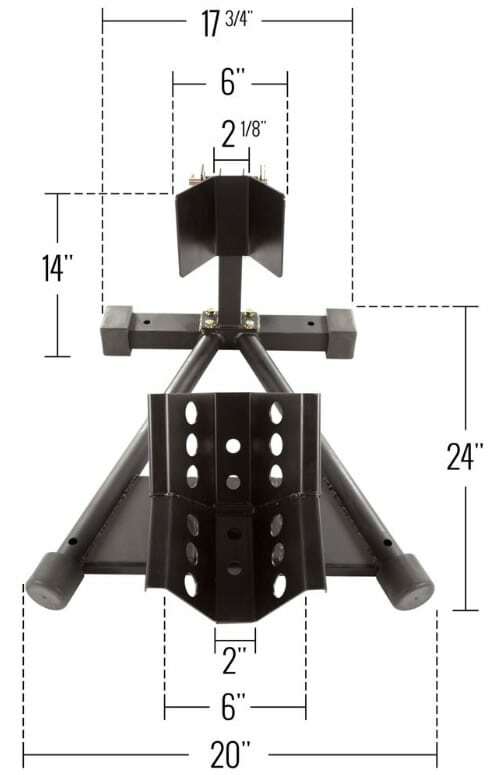 I figured, considering I can get three for the price of one Condor, if it lived up to my expectations I would buy a second one to upgrade the chock on my motorcycle table lift as well. Did I make the right decision? Note: For anyone reading this at work, or if for whatever you don’t have speakers you can play audio through, I put closed captioning on all of my videos, so you can play it on mute and read along. Don’t forget to Like and Subscribe for more video content! Unboxing was quick and easy. 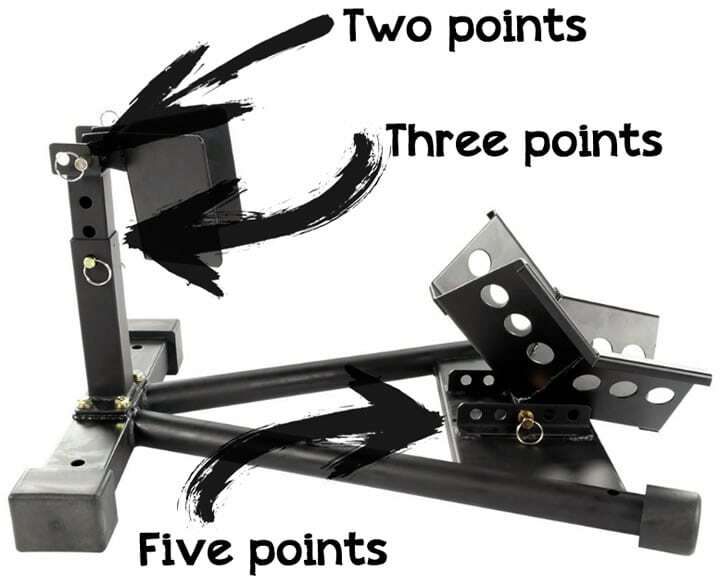 There are really only four components to the wheel chock, and a bag of hardware. Assembly / Installation was a breeze and takes 10 minutes the first time (and 5 minutes thereafter). The instructions were only five or six steps, and the first one is already done from factory. Better still, the instructions are detailed to the point of telling you what size wrench you’ll need. There is no additional hardware for bolting the chock to your trailer and/or table lift. You need to get that yourself for about $3.50. The cotter pins are a little small. 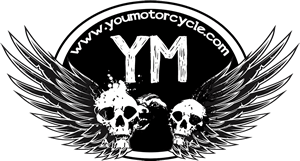 They’ll be fine for the every day user with one motorcycle, but if you’re towing different motorcycles every week you’ll want to spend $1.50 at the hardware store for some bigger ones. You can see full installation in the video review posted above. Altogether you get thirty different configurations in total (go ahead and count it, you’ll see), more than enough to fit every single motorcycle in my garage right now (there are 5 of them, ranging from 250cc beginner bikes to a pair of Harley-Davidsons). I first tested this motorcycle wheel chock on the garage floor with a 2008 Yamaha FZ6 sport touring motorcycle. The wheel chock was excellent. It firmly held the FZ6 perfectly vertical, even when I started slapping the tank on either side. I never felt nervous pushing the motorcycle from side to side, or leaving it unattended on the chock. It was obvious the Yamaha was not going anywhere. That’s when I decided to bring Alice over. Alice is a beautiful, curvy woman. The lightweight little Japanese girl lifted out of the Black Widow cradle with ease. After a quick adjustment, Alice, my 620 lb, 2006 Harley-Davidson V-Rod took the Yamaha’s place. Alice landed softly into the Black Widow’s arms. My protective instincts kicked in, and I carefully let go over and stepped away. Alice stood there, firmly, calmly, and comfortably. I walked around her. She looked good. I started spanking her, little slaps to her right side and her left. She barely flinched. She was thoroughly and properly restrained. She wasn’t going anywhere. The scene played out and when it was all over, I pulled Alice out of the Black Widow, impressed she had stood so perfectly. If you want to watch, check out that video above. A bike her size doesn’t always roll backwards so smoothly, but she did. This Black Widow wheel chock is damn well designed. DiscountRamps must be out of their minds to sell this wheel chock at this price. Buy one before they see this review and raise their price. OK, yes, it would have been nice if they gave you mounting hardware for bolting to a trailer, or slightly larger cotter pins, but that’s something you can fix for $5 or less at the hardware store. 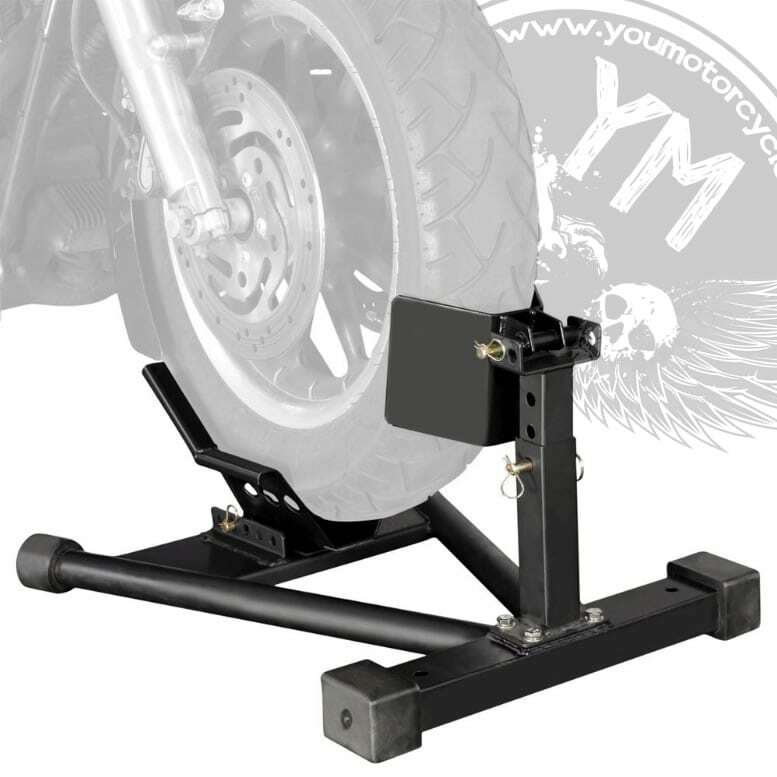 In case it isn’t clear enough, if you’re in the market for a wheel chock, the Black Widow 2 Piece Motorcycle Wheel Chock is the right one.